A last ditch meeting to save a post office earmarked for closure despite thousands of people signing a petition to save it is to be held this evening. The Brunswick post office on Western Road, Hove, will merge into Melville Road post office from Monday, 15 February, closing its doors for the last time at 12.30pm on Saturday, 13 February. 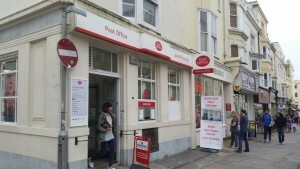 The Post Office said the merger was the result of declining customer demand – but campaigners, including Hove MP Peter Kyle and ward councillor Ollie Sykes, said it would leave pensioners either facing a steep walk uphill to Melville Road or joining large queues at Churchill Square. Cllr Sykes has organised an informal meeting tonight, Tuesday 18 January, to consider final strategies. He said: “I’m deeply disappointed at this decision by Post Office Limited (POL) which ignores the opinions of more than 7,000 residents, the voices of local independent business and the needs of elderly and infirm residents of Brunswick Town who will find a trip to Churchill Square or Church Road very difficult. “The entire proposal to close or merge the Western Road Hove Post Office was presented on false grounds, with the assumption that people would travel to Melville Road once 22 Western Road was shut. “This was never going to happen and instead residents and businesses will have to join the huge and growing queues at Churchill Square. “Brighton Pavilion’s MP Caroline Lucas has been working up to the last minute to persuade POL to change their minds on this, because of the expected impact on the Churchill Square Post Office but this work has also fallen on deaf ears. Roger Gale, Crown Network General Manager, said: “We understand how important Post Office services are to people in this area of Hove and we are confident that our network will meet the needs of customers in the area. Western Road Post Office closes at 12.30pm on Saturday 13 February and the services transfer to Melville Road Post Office at 9am on Monday 15 February. As well as the Melville Road branch, Hove, Brighton and Blatchington Road are all less than a mile from Western Road, and three other branches – London Road, St James Street and Portland Road are less than 1.5 miles away. The merger was decided in October following a 12-week public consultation, which led to 7,400 people signing hard copy and online petitions protesting the proposals, 400 individual representations and two public meetings. In Canada, my sister no longer has home postal delivery. She is firced in the country’s capital to drive to a depot to collect post. They lost actual post offices some years ago and the woman who shut down postal service normality there was hired to do it here. Last year Cameron sold off the last shares in Royal Mail – we are de-civilising and making ourselves vulnerable by forcing everything online. Power failure, satellite failure – who knows where it will come from – weather disaster – could be anything but all our eggs are going into one very unsafe online basket. A very good point Valerie; at my workplace, all of our documentation is stored in the ‘Cloud’. Easily accessible when the Internet is working, but when our Internet connection goes down (as it frequently does), all of our documents, forms etc become inaccessible.